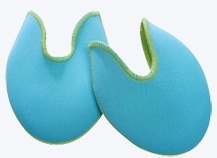 Bunheads BH1095 this crescent-shaped pad is made of a thin layer of gel material inside a fabric pouch. Great for wider feet and for those who want only the toes cushioned. Newly refined design offers more coverage in the bunion areas, a deeper cut vamp to better match the line of the pointe shoe, a sleeker shape that hugs the foot and keeps pads from sliding or bunching and an enhanced gel formulation that helps prevent bottoming out.